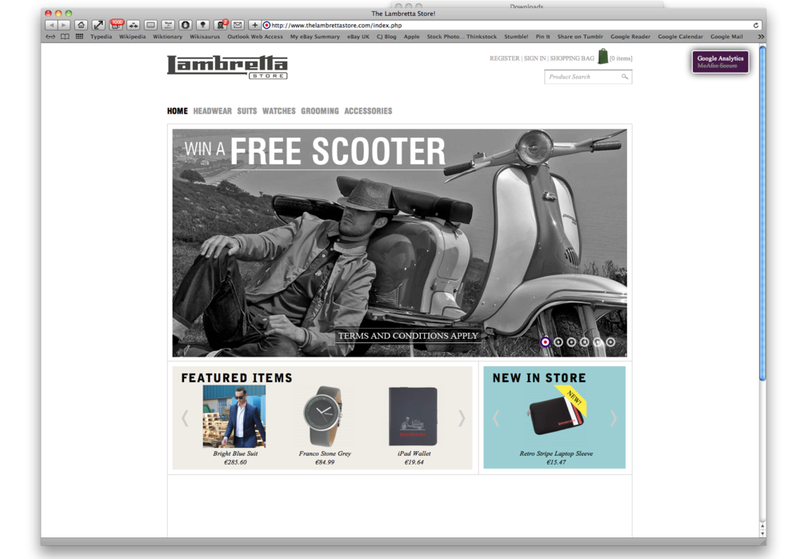 New Online Lambretta (brand) Store goes live… Win a Lambretta, and get free gifts. Fresh up today, the new online store for all that Lambretta branded stuff. Headwear, Suits, Watches, Accessories… some of it’s good, some of it’s ok, some of it misses the mark for me. I’ve written about that all before, here, I won’t cover old ground! Interesting opening offers though; make any purchase before the end of the year and you’ll be entered into a draw to win a brand new Lambretta (not the beautiful Series 2 shown… boo!). There’s also some free stuff with your order… stickers, wallets, and a jubilee bus tin. Remember, although these guys own the Lambretta brand, and the rights to put the Lambretta name to everything from aftershave to socks (I’ve got some socks, they’re not bad), they’re not the only game in town… and you can get some great stuff from the Lambretta Club of Great Britain (LCGB) Shop. Here. Check out the Lambretta Store here. This entry was posted in Ephemera, Kit, Lambretta Life and tagged Lambretta brand, Lambretta clothing, Lambretta store, online, retail by crocodilejock. Bookmark the permalink.